THE THIRD EDITION OF ONE OF THE BEST KNOWN VOLUMES DEDICATED TO MOROCCO HAS JUST BEEN UPDATED AND RELEASED FOR 2017. ITS PAGES TAKE THE READER FROM THE ATLAS MOUNTAINS ACROSS TO THE SAHARA DESERT. An essential book for many motorcyclists and a true “must-have”, dedicated to a year-round destination that is within reach of European travellers. For the traveller who takes pleasure in personally planning their travels, this book is an excellent starting point. Its pages explain in detail (including off-road with GPS directions) a route of over 10,000 km from the High Atlas Mountains to the border with Mauritania. The book provides directions which assist the motorcyclist in selecting and preparing a route, deciding on the best places to visit, the use of local guides, the driving techniques needed and the length of time required for each segment of the journey. – 56 routes explained in detail, ranked in order of difficulty, scenery and the best time of year to travel, including over 40 support maps. 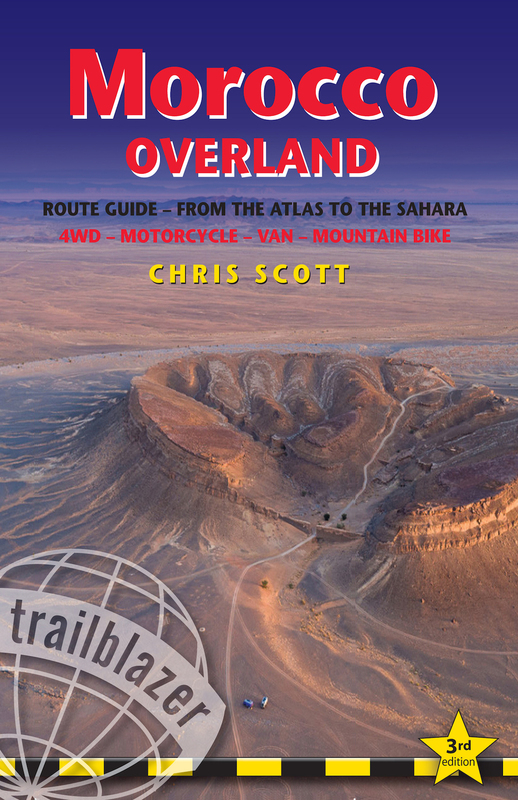 “Morocco Overland” shows the rider how to tackle and safely explore adventurous Morocco, often away from tourist areas, from the passes in the High Atlas Mountains to the sandy slopes of the Sahara. Here is a brief excerpt from the chapter suggesting where to go according to the time of the year: “Especially when on a motorcycle, avoid the Moroccan Sahara between June and September. It’s almost inevitable that for a month or two, the daily temperatures are close to 40 °. In the winter it rains in the North and in the high and middle Atlas, snow falls around 2,000 meters. If you do not have any alternatives, check route information and bring heavy, waterproof clothing. If it does not rain, you will be traveling under clear picture-postcard skies of light blue. Basically, there are two times of the year when you can cross Morocco from North to South without encountering weather related problems; October to November and February to March. Amongst these periods, the late Moroccan autumn is the absolute best choice, as it arrives with light winds, hot temperatures and amazing scenery. The best websites to visits for weather Information are; weatheronline.co.uk/Morocco.htm and uk.weather.com/global (click North Africa) “. His first trip to the African desert dates back to 1981 aged just 21 years old. And Chris returns to it practically every year. In 1989 Chris organised his first “Sahara Motorcycle Tour”. 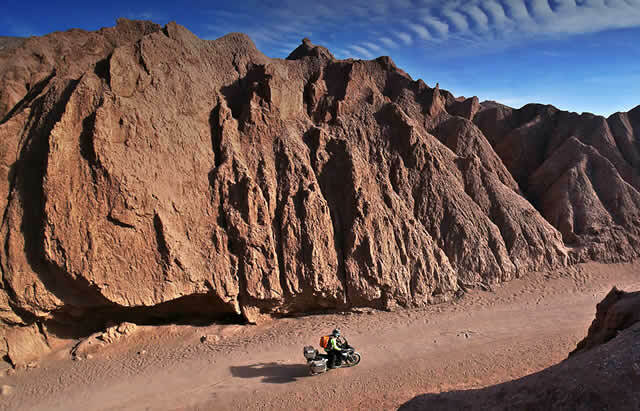 The awareness of having gained profound knowledge of the Sahara world lead him to write a report for the Royal Geographical Society which became the “Adventure Motorcycling” manual, now in its 7th Edition, more than 25 years after its first publication in 1991. Chris began to collaborate with the Rough Guide series of travel guides and was the co-author of the Rough Guide to Australia. Since then Chris has not stopped writing. He writes articles for magazines and newspapers around the world and is a regular guest on television programmes, such as The Adventure Travel Show. He is often consulted by photographers and novelists and produces films that are aired on the National Geographic Channel, Sky TV and Channel 4 in the UK. In 1998, Chris returned to focus on the Sahara, his great love and he began working on his opus of Sahara Overland. Its success brought the publisher to print a Second Edition in 2005. A completely updated Third Edition is now available with enhanced contents.